U.S. Air Force Academy 1999 - Intro - Travel Adventures in Colorado, Rocky Mountains, Italy, etc. The U.S. Air Force Academy (USAFA), an 18,000 acre facility, is located Northwest of Colorado Springs, in the foothills of the Front Range of the Rocky Mountains, about a 10-minute drive from our house. The Acadamy was authorized in April 1954 by President Dwight D. Eisenhower. Colorado Springs was chosen as the site, and construction began in 1955. The first Cadet Class also started in 1955 in a temporary facility in Lowery air Force Base in Denver. The Cadet Wing moved into its permanent home in august 1958. The first class of 207 Cadets graduated in June 1959. Today the enrollment is about 4,500. The first woman Cadet graduated in May 1980. The Air Force Academy is Colorado's most frequently visited man-made attraction. Open to the public are: the USAFA Visitor's Center, the Planetarium, the Cadet Field House, and the Cadet Chapel. Guided walking tours are also offered. Each year our good friends, Becky and George Nehme, get us tickets to one of the big inter-military home games at USAFA. This year we went to the Air Force vs Army game at Falcon Stadium on Nov. 6, 1999. 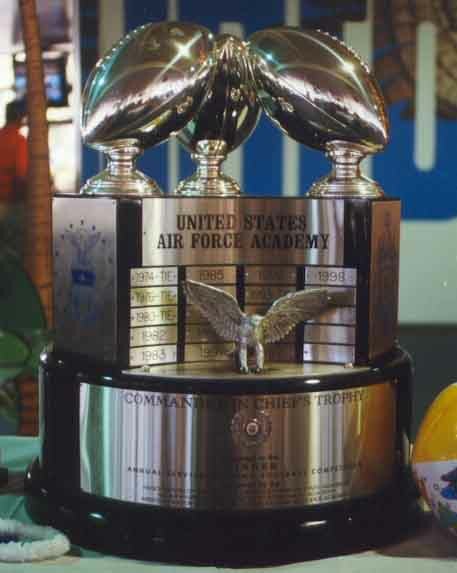 Air Force won the game 28 to 0, and having also beat Navy, they were awarded the Commander-in-Chief's Trophy for the 18th time. Included here are some pictures from the game and its events, as well as some photos of the grounds.